I can't wait to put it together weekend after Easter! I am needing to build a new quad-core 64 bit workstation that's primary function will be to perform as a lab and run several virtualized operating systems at the same time. Mostly this will be Xen with some experimentation into KVM and some Sun Virtualbox as well. Needs to support what KVM and hypervirtualization wants which appears to be AMD-V or Intel VT-x. The host will also be my main software development workstation (Java and C++) if that matters. This is for a personal project so money is a factor but will balance against need/best practice. The host OS will be Gentoo Linux latest kernels. This will NOT be a game type machine and video is of relative unimportance. I have not kept up with chip technology these days but basic searching leads me to believe I want for a low end either Phenom X4 II (quite affordable) vs. i5-750 (still quite affordable) but seems less mature. Or I could go to the high end of my cpu budget with a Intel Core 2 Quad Q9650. Suggestions for a Linux only VM and development workstation? Also the mobo supporting this chipset will have a lot to do with it as well since this will also be a desktop. I am trying to conserve my foot print. A severely limiting factor is the need for 16GB (4x4GB DDR2 sticks) of memory. I am sole sourcing Newegg here because of past reliability and excellent pricing. As of 2009-11-01 this limited me to either the Intel LGA 775 or AMD AM2 socket type. <b>Update 2010-03-25</b> considering upgrading from the Xeon 3320 to the Xeon 3360 the main difference being 6 vs 12MB of L2 cache mainly. Not sure the double L2 is that much worth the price difference but it might be. $266 vs $219. The Q9550 is built for 3D rendering and therefor heavy desktop and graphics. The Xeon's are essentially server chips. In my case I want a server acting as a desktop so Xeon's are fine here. No gaming just simple desktop functions. The X3360 and the Q9550 are essentially the same CPU; revision (C1), stepping, and microarchitectures and identical. The only difference is that the Xeon CPUs come from a different batch and have one additional command instruction called I/OAT. This command essentially is for server use and is dedicated to processing TCP/IP overhead which frees the CPU to do other command processing. The Q-series Yorkfields are compatible with the Bearlake chip-sets. One draw back for thread programming (parallelism). The Xeons don't support Hyper-Threading Technology or SMT. So each core is a thread itself. Still threading but not like a server would be doing. I have some lower end desktops that are capable of this for testing purposes. The bottom line is I now get four physical cores instead of eight HT threads. So this made me consider the Intel i7 (i7-920 for example) chips again although they are socket LGA 1366 which is fairly new and the mobos available are farther and fewer between. as you can see the i7-920 now brings four physical cores but also 8 HT threads. A big plus! So I started looking at LGA 1366 sockets. This also puts me now in DDR3 memory which is some what of a jump in price. Right now I am leaning towards the ASUS P5BV-E/SAS with a Intel Xeon X3320 Yorkfield quad-core 2.66 GHz cpu. On Intel machines the memory controller is located on the northbridge (motherboard). 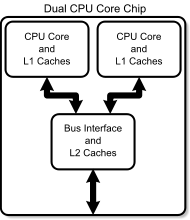 On AMD machines the memory controller is integrated into the processor. "What is the maximum frequency for DDR3 memory when used with Intel� Core� i7 desktop processors? These processors support DDR3 memory with a maximum frequency of 1066 MHz. If faster DDR3 memory is used (such as 1333 MHz or 1600 MHz), it will be down-clocked to operate at 1066 MHz." The SPD is used to make sure that memory slower than 1066 is read at the correct number of cycles. But the adjustment upwards stops at 1066. So by default, if your memory supports it, the speed is 1066. Summing up, the CPU will down clock your memory but will not up clock it past 1066. For that, you need to tinker with the BIOS." ASUS P6 mobos have 6x240 PIN DDR3 SDRAM. I want 4GB sticks for maximum memory upgrade in the future. I will need 8GB of ram now. "For SATA RAID Areca is the best. 3Ware is almost as good." Video card will be a GeForce 7950 GT since I already posses this card from a previous upgrade and Gentoo/Linux supports it just fine.